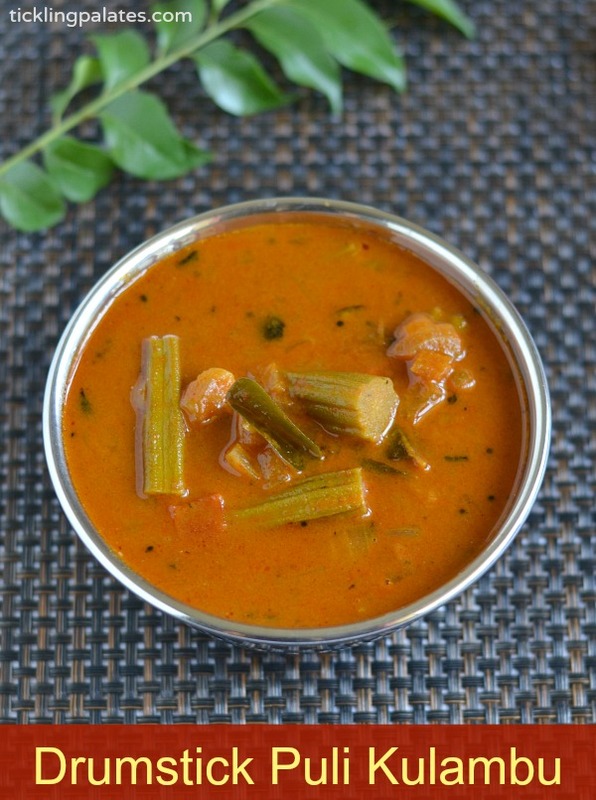 Murungakkai Puli Kuzhambu recipe. 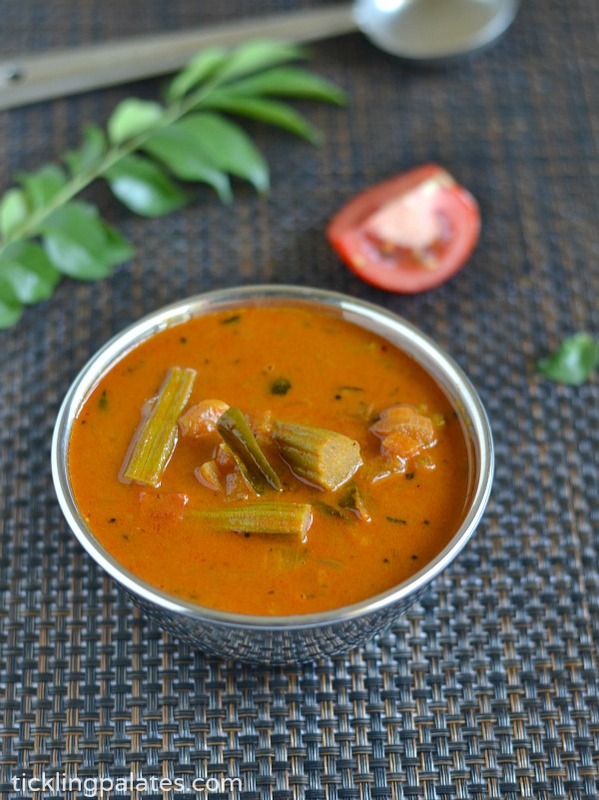 Drumstick Puli Kulambu is a tangy tamarind based South Indian gravy which is made using a single or a combination of vegetables that is served with rice for lunch. As such Puli Kulambu makes a very rare appearance in my household as there are no takers for it, but I love to have it with hot rice dribbled liberally with ghee. Of all the Kulambu varieties, I love puli kulambu and especially this Murungakkai puli kuzhambu very much as the flavor and aroma is more appetizing than the other varieties of puli kulambu. The drumstick (Murungakkai) soaked in the kulambu is absolutely mouthwatering to eat along with curd rice. If you have not given it a try, it is high time you did. 1. Instead of using the combination of sambar powder and coriander powder, you can use store bought kulambu chilly powder. 2. I prefer to add 1/2 a tomato while I reduce the amount of tamarind extract to compensate the tanginess as tamarind is a heat emitting substance. 3. 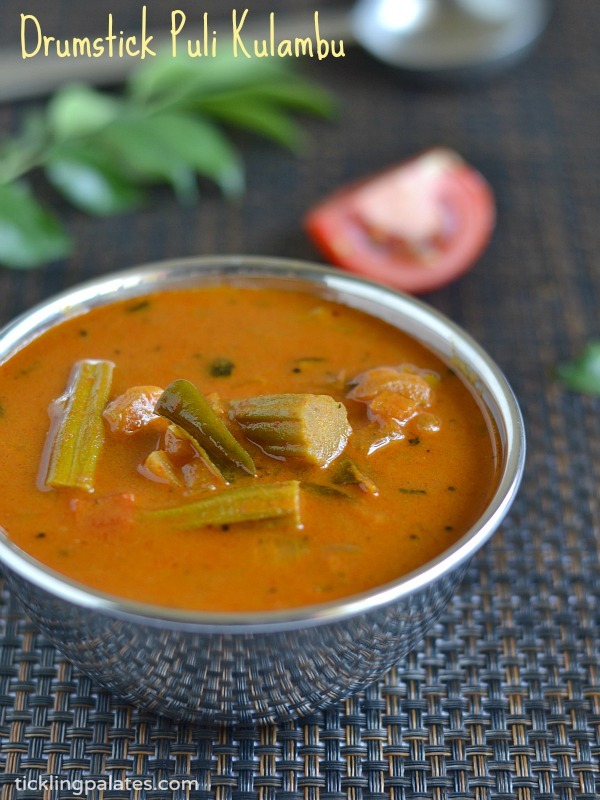 Instead of sambar vengayam, you can also use regular onions. 4. Using sesame oil (nalla ennai) enhances the flavor of the kulambu. 5. Using vengaya kari vadagam for seasoning is optional. I add it because I love its flavor in the kulambu. Do check out Vendakkai Puli Kuzhambu, Pavakkai Puli Kulambu, Chettinad Kalyana Vatha Kulambu and Manathakkali Vathal Kulambu. Murungakkai Puli Kuzhambu using drumsticks that is served with rice for lunch. Soak the tamarind in hot water for 15 to 20 mins, extract the pulp and keep aside. Chop the shallots into half and chop the tomatoes finely and keep aside. Cut the drumstick into finger length pieces and keep it ready. Heat a pan with oil, add mustard seeds and kari vadagam and let it splutter. Add asafetida, fenugreek seeds, curry leaves, chopped sambar vengayam and sauté over medium flame till the onions become pink. Add the tomatoes, drumsticks, mix well and close with a lid. Reduce the flame to low and let it cook for 4 to 5 mins. The tomatoes will become mushy and the drumstick would have softened. Add sambar powder, coriander powder and mix well. Sauté well and you can see the mixture becoming dry and thick. Add the tamarind extract, salt and add 1/4 cup water approx., if you find the mixture to be too thick and mix well. Let the kulmabu cook over medium flame for 8 to 10 mins. Switch off stove and take off fire. Murungakkai Puli Kuzhambu is ready. Perfectly done!feel like grabbing it! 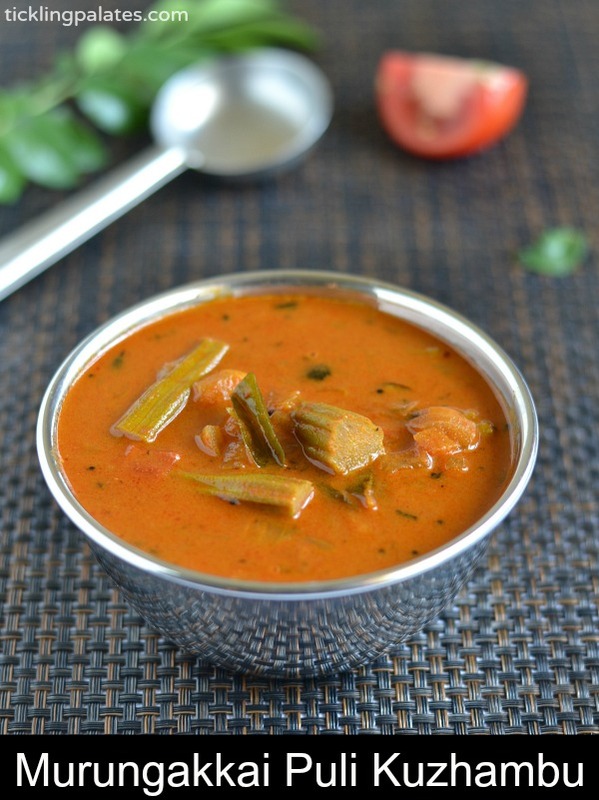 Fingerlicking kuzhambu, i can have this flavourful tangy kuzhambu with some rice and papads. Tried this today… Simply loved it.. I get less chance to cook pulikulambu as my husband doesn’t like.. But today he liked it..
Hi Uma, Thank you for your lovely feedback. Very happy to hear that your husband liked it.